Year and a half ago, I was working with a software that used Redis as a buffer to store large sets of text data. We had some bottlenecks there. 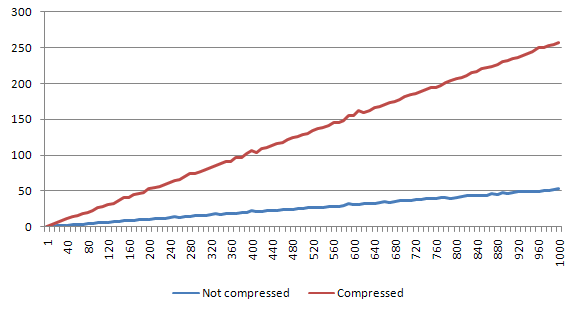 One of them was related to Redis and the large amount of data, that we had there (large comparing to RAM amount). Since then, I’ve wanted to check if using Zlib library would be a big improvement or would it be just a next bottleneck (CPU). Unfortunately I don’t have access to this software any more, that’s why I’ve decided to create a simple test case just to check this matter. To make it quite accurate I’ve tested it 10 times for given case and also for different number of iterations (from 1 to 1000). You can check the results on charts below. So, as you can see, except the first case, with the empty file, we gain around 75-85% of space, when using the Zlib compression of text data. In my opinion this is a huge improvement. First let’s see how the read-only performance decreases due to the compression mechanism that was implemented. On the chart we can see both – the non-compressed and compressed script versions, both for given (same) number of iterations. 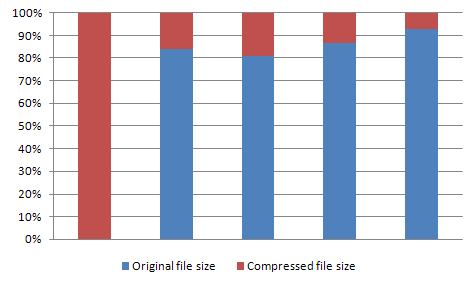 Each chart represents one file size. For empty file, the speed decrease is around 6%. 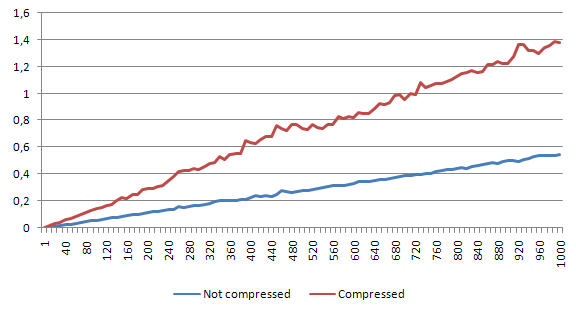 For small file, the speed decrease is around 26%. But still – 1000 reads take us less than a half of second. 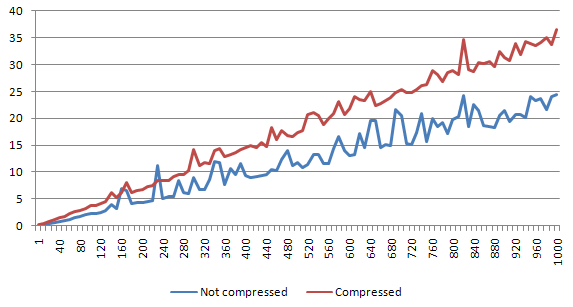 Here the difference is around 47.5% – the bigger the file gets, the bigger the decompression overhead is. 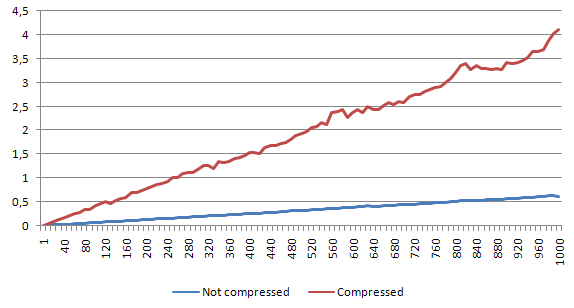 Since the read operations from Redis are quite fast, the decompression time seems to affect the whole process in a quite high level. Diffence is around 55%. Which is still tolerable. Of course if we would do a lot of readings that should be performed really fast – this would be a problem. 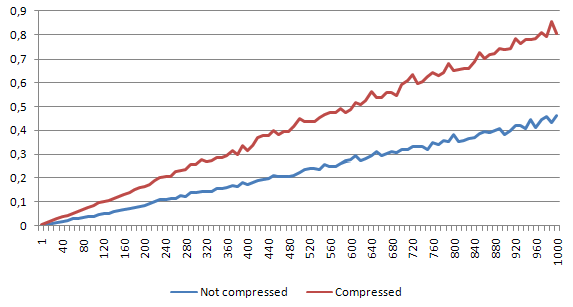 Difference is around 33.5%, which is quite weird, since it is lower than with the previous smaller file. 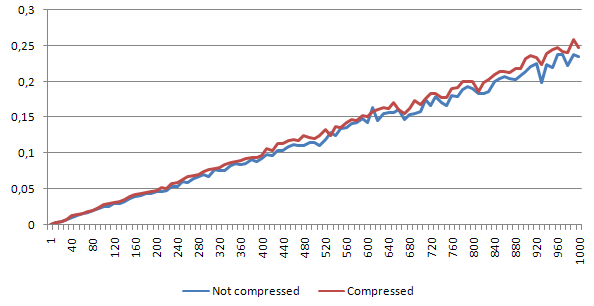 As you can see above, the decompression overhead is around 30-50%. Is it much? It depends what you are doing. If you are ready to exchange such a speed loss for a memory saving, this might be the solution for you (of course for now we are talking about the read-only scenario). Difference is around 29%. 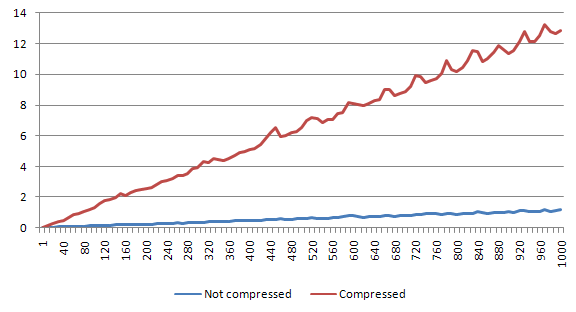 Seems like the compression impact comparing to decompression is way bigger (nearly 5 times). This doesn’t look good for the write-only test case, however let’s see more examples. Difference is around 161%. 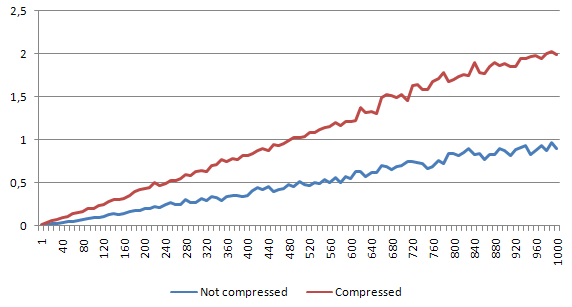 This is huge difference – even with small data amounts, compression seams to really influence the write process. 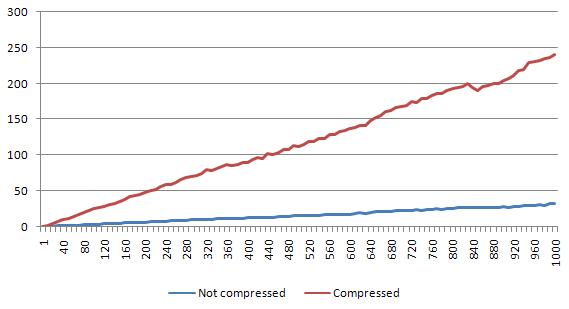 It seems like the heavy duty write-only usage with Zlib compression won’t be a good idea. The time spent compressing the input data is way beyond any acceptable level. 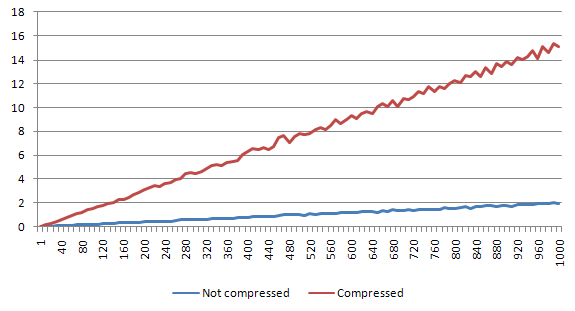 Write process increases so much, that it would be way better to use storage that has compression already implemented (or one that is not in-memory). This is the last test case. I’ve performed one write per 1 read. First of all, if you have such a problem at the beginning of your software development, probably you should use a different data-storage (if you plan to have more data than you can handle in memory). 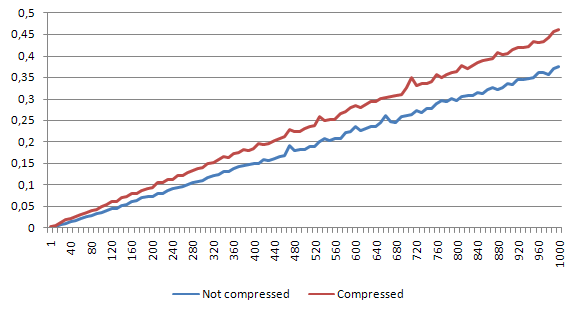 This article and the compression “tweak” that I’ve tried to check/use should be implemented only when you don’t have any other option and the Redis memory usage is your biggest bottleneck. Also, you should not try to use this idea when you do a lot of writing to Redis and a only few reads per data chunk. This would slow down your software dramatically. Of course if you do less than few hundred operations per second, you probably would not feel this, but still, try to think about future issues as well. To be honest, I’m a bit disappointed. 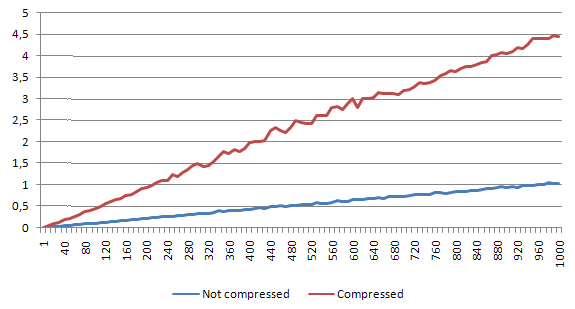 I thought, that using the compression would not be such a big overhead, however it seems like Redis is way faster than I thought comparing to compression process. and thats all. After this, Resque works like a charm!